Back home in LA, Jessica Fox worked for NASA by day, and for a film-maker by night. But, when the elite seek out those ideal places to live, they don't choose LA. They choose places like Wigtown. Jessica Fox swapped California sunshine for Wigtown. "We walked in silence through a soft mist. "As we turned a corner, a view unfurled of silvery marshland. "'This is the most beautiful place in the world,' I gasped." Jessica Fox and her partner, Shaun. Photograph: Martin Hunter. It's that place near Newton Stewart. Only a relatively short hop from London. Jessica now lives above a secondhand bookshop, in an old Georgian building. Jessica had typed "used bookshop Scotland" into Google. 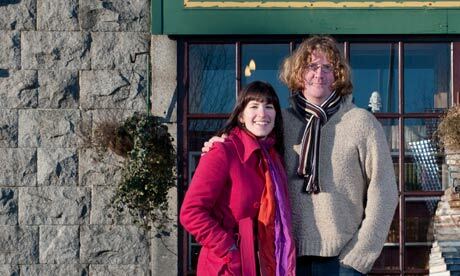 She discovered Wigtown: Scotland's National Book Town, "a royal burgh of 1,000 residents and 12 bookshops beside the sea in Galloway." Miss World, in Wigtown. www.t-pageant.com .. Arriving in Wigtown's charming main square, Jessica "found the town was everything I had dreamed and more - colourful stone houses, bookshops and vistas of mountains, sea and marshland." There was "the merry chaos of the book festival, the hills to climb, crumbling castles to explore and people to meet.... I threw myself into the world of Wigtown, even playing the first ever cross-dressing Jewish Santa for the Christmas fair." This same story with more detail was in the mail on line in January. No disrespect but it seemed a load of pants, she went "home" at the end of her vacation. Further to previous comment, maybe the question is how a lady from Nasa with a Scottish story gets so much publicity. Maybe, given that Wigtown is so close to Ireland, it has something to do with colonisation, both past and future. After all, once the one world society is complete - colonisation of space is the goal. 'Jewish cross dressing Santa' very LA...Mazel Tov with that. A little strange, with some inconsistencies. In the Guardian her bloke's name is Shaun, while in the Daily Mail it was Euan. In the Guardian "we faced one another awkwardly" upon first meeting, while in the Daily Mail "I ran into his arms for our first kiss"
Dear Aang, I may have been, but was not trying to be, facetious in my comments.